The second week of June 2018, the Digital Bookmobile traveled across the south-western border of Minnesota to four charming cities within the Plum Creek Library System. Our first stop was at Nobles County Library on Tuesday, June 5th. This diverse community employs over 2,500 workers in the meatpacking industry and draws in people from all over. One librarian told me there are around 22 languages spoken in the city of Worthington! 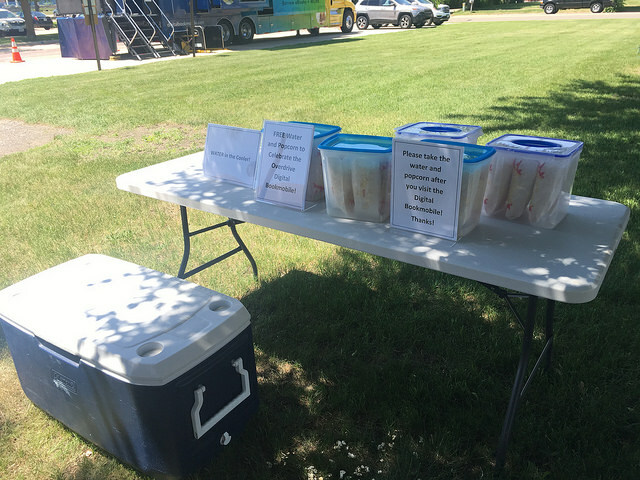 Free popcorn and water at Nobles County Library! Our second stop was at Redwood Falls Public Library on Wednesday, June 6th. Children’s Librarian Jill Deinken hosted her regular story time that morning with a twist, on the Digital Bookmobile! Over 20 children and their guardians boarded the Digital Bookmobile to listen to great stories. One was read as an eBook, the other a paperback book. Intertwined between them was a song and an interactive review on a felt board. It was so fun seeing children listen and learn on the Digital Bookmobile. Story time on the Digital Bookmobile at Redwood Falls Public Library. We saw a steady flow of visitors the rest of the day, including three visitors who were able to safely experience the Digital Bookmobile by using our wheelchair lift. Our third stop was at Jackson County Library on Thursday, June 7th. 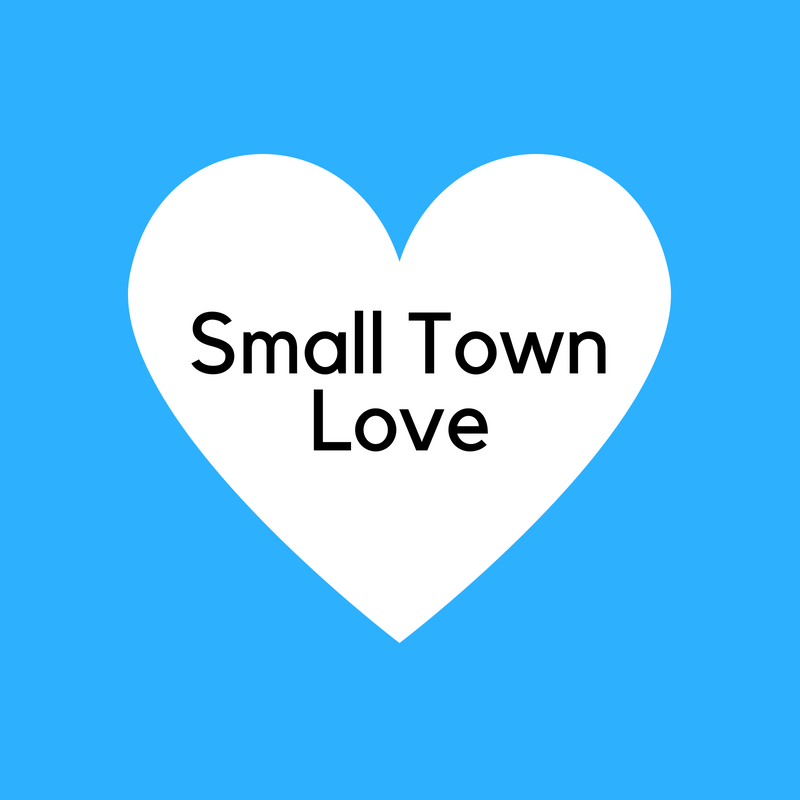 The small town of Jackson, MN has a population just over 3,000 that nurtures a learning environment. Jackson County Library certainly cultivates that learning environment through fun programming and an array of services. Substitute Librarian Mackenzie Schley did a great job organizing their Digital Bookmobile event. She even made a mini bookmobile craft that is too cute (pictured below). 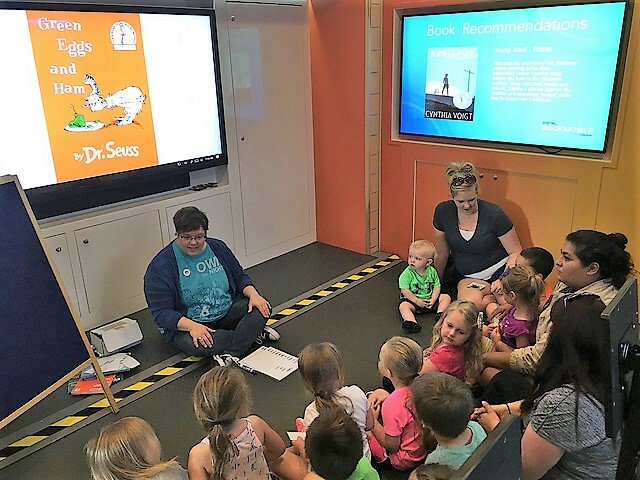 A total of 113 visitors toured the Digital Bookmobile, and on their way out, Jackson County Library raffled off 3 Kindle Fires and had a cookie and lemonade fundraiser. View the news broadcast from KEYC News 12! Photo taken by a patron at Jackson County Library. Last stop, Windom Library on Friday, June 8th. This old bank turned library is small but mighty. Three librarians, Dawn Aamot, Nancy Sajban, and Julie VanDeWiele, bring a warm spark to this city of 4,500 and were excited to learn about the new app Libby. 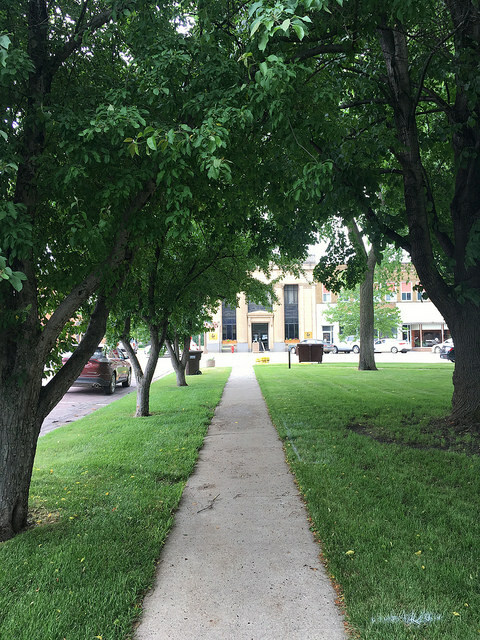 View from the Digital Bookmobile looking at Windom Library. After our week in south-western Minnesota, the Digital Bookmobile headed east toward the Chicago area in IL. 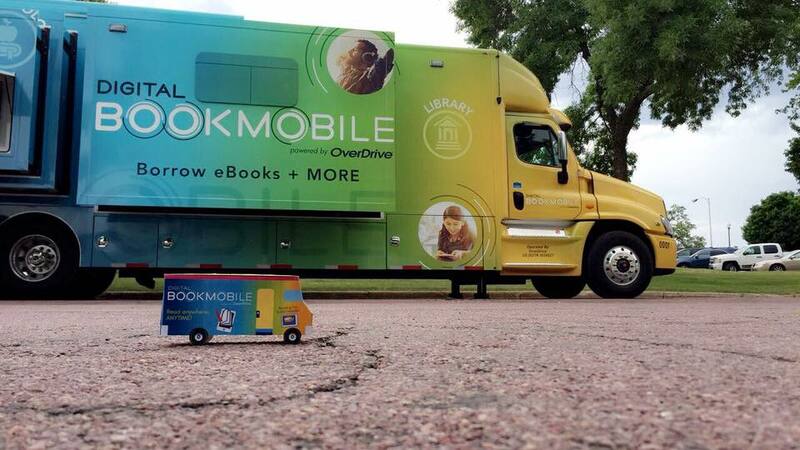 Despite the size of a city, the Digital Bookmobile travels across North America to promote a “world enlightened by reading.” We’re thankful for large and small libraries alike for providing the best collection of premium digital content through OverDrive.